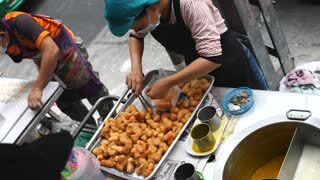 Asian Street Vendor Selling Pa Thong Ko - Popular Thai Donuts. Mai Thong spider on web in tropical rain forest. Slow motion, jogkradin waterfall is located in Thong Pha Phum National Park. Kanchanaburi Province, Thailand. jogkradin waterfall is a waterfall with only one floor that flows down from the cliff about 30 meters. The Thong Dhammacak, the Buddhist Flag and the flag of Thailand waving in the wind, overlooking the beautiful buildings of Bangkok, Thailand.